The following tutorial explains the process of converting a ThinkFree Office created file format to a PDF document. To be able to make the conversion you will need the novaPDF printer driver installed on your computer. To install the application, access the Download page and download the installer on the computer. The ThinkFree Office is an application developed in Java and released by Haansoft and it is available cross platform on Windows, Mac, Linux distros and it even has an Android edition. The application also has an online version offering the users the possibility to manage their files and edit them directly from the browser without the need of a local Office installed. The space available for each account is about 1 Gb for files. The local Office version includes a word processing tool, a spreadsheet application, a program for presentations and a Note for blog editing and WYSIWYG HTML development. It doesn't have any native file formats available as it saves everything (read and write) in Microsoft's doc, xls and ppt formats. The web based version also contains these features and it is based on Java and Ajax technologies. It has a 30 day evaluation period and in some countries is only available as a paid service. Basically this can be viewed as a clone of Microsoft Office with stripped down functionality and reduced interoperability as it supports and handles the native MS file types. The license for this is proprietary and closed source making it hard to combine with other software for a successful Office experience. The online version makes up for it with the services offered as it can be accessed from pretty much anywhere if the computer has an internet connection available. Still the users need an office installed either MS or ThinkFree. This is not the case with a PDF file as you can view it on the fly, it has better portability and archiving properties and can be viewed by a lot of applications. Also converters like novaPDF can create enhanced PDF's from the ThinkFree files with security added, signatures, bookmarks, custom layouts, embedded fonts and all this at a much lower expense. Open your ThinkFree application and after locating the file you want to convert to PDF, open the file in the interface by clicking on File->Open or use the Ctrl+O combination. After that, click on File->Print or press Ctrl+P to prepare the file for printing. 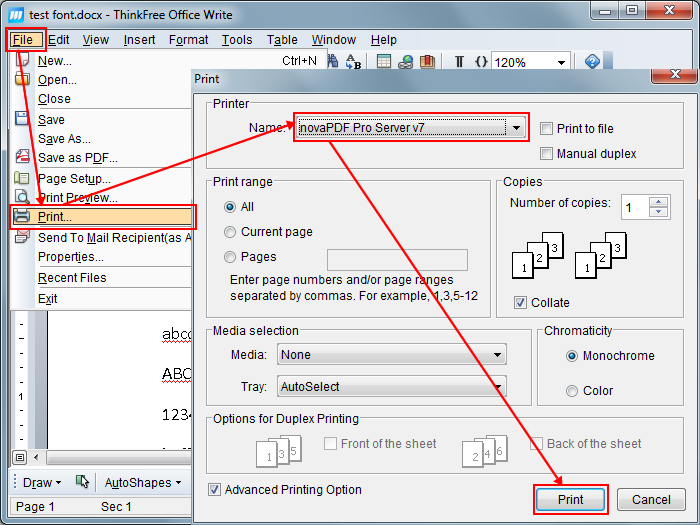 In the Print window select novaPDF as the printer name and click on Print. In the Save PF File As windows select after save actions if needed and click OK. The conversion will be completed after. This tutorial shows how to convert the native SolidWorks file formats (slddwr, sldprt and sldasm) to PDF documents using a PDF printer driver such as novaPDF. If you do not have the novaPDF printer driver installed on your computer, use the Download page to download and install it. Using Microsoft PowerPoint you can create impressive presentations that your audience will love. However, if you are collaborating with other users and want to ask their opinion regarding the presentation without them having PowerPoint installed, a solution is converting the presentation to PDF and sending it to them for review. The conversion to PDF is very simple; you just need a converter such as novaPDF installed and simply print your presentation to it. If you don't have it installed, you can obtain a copy from the Download page.